This entry was posted on Thursday, April 4th, 2019 at 4:00 am and is filed under mathematics, physics. You can follow any responses to this entry through the RSS 2.0 feed. You can leave a response, or trackback from your own site. Okay, here’s a guess about my puzzle, which may be implicit in Göransson’s work. I’ll talk about the 2d Kepler problem, but everything should generalize to the 3d problem if it works at all. Take an ellipse in the plane with its focus at the origin. Draw a point on it. This describes a possible orbit of a planet in the plane, with the point indicating where the planet is at time zero. We can think of this ellipse as the 2d projection of some great circle on a sphere in 3 dimensions. The diameter of this sphere is the semi-major axis of the ellipse. The center of this sphere is not the ellipse’s focus, but instead its “center”. The point on the ellipse gives a point on this great circle, so we get a “pointed great circle”. Now take all pointed great circles on the sphere. Their projections give pointed ellipses, all having semi-major axes of the same length. All these ellipses have the same center, too, but they have different foci. Translate them so their focus is always at the origin! Now we have all possible pointed ellipses with the same semi-major axis and with focus at the origin. These are all possible orbits of a planet with a given fixed energy. Why? 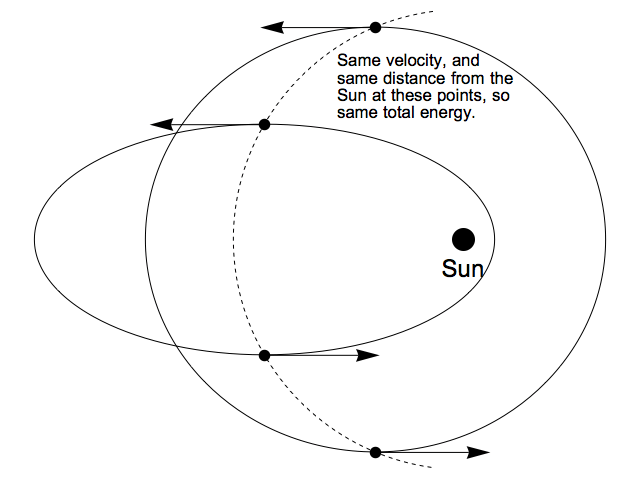 Because the energy of a planet in a given orbit is a function of the semi-major axis (together with the planet’s mass, the Sun’s mass and the gravitational mass). So, we’ve gotten a one-to-one correspondence between elliptical orbits of a planet with a given energy and pointed great circles on the sphere. This gives a way for the rotation group SO(3) to act on this set of elliptical orbits! The claim is that these SO(3) symmetries are the ones that, via Noether’s theorem, give the angular momentum and Runge–Lenz vector as conserved quantities! Enjoyed the post. I can’t see why the group acting here is SO(3). Also, if you grab a planet at any point of its path, and move to anywhere the same distance from the sun you will most probably get a non periodic orbit, or am I wrong? I can’t see why the group acting here is SO(3). Yes, it’s not obvious without calculations, and not obvious from my talk. I believe it can be made more obvious, and my comment, above yours, is my guess as to how. This contains a link to an earlier post here on Azimuth, about Göransson’s work on this issue. Check that out! I just want to add some background that might be helpful. I know John already knows all this, but people reading about these higher-dimensional symmetries for the first time might not. where is the force constant for the Kepler problem. points along the axis of symmetry of the orbit, from the centre of attraction towards the point of closest approach. It is conserved for any given orbit, and its length depends on the eccentricity of the orbit, going to zero for a perfectly circular orbit. So is fixed by energy alone, and then, for fixed energy, is proportional to , while is proportional to the scaled LRL vector . where the angular momentum vector is construed as a bivector giving the plane of the rotation, and is a unit vector orthogonal to the 2 or 3 of ordinary space. What does this bivector mean? There are two ways we can associate the elliptical orbits of the planet with great circles on a sphere in one higher dimension. John has already described one, used by Göransson, where we project great circles on a higher-dimensional sphere orthogonally into ordinary space. The other way, with an older pedigree, is to consider the “hodogram” of the orbit: the curve traced out by the velocity of the planet. For the Kepler problem, this will always be a circle, but its centre will be displaced from the origin if the orbit itself is non-circular. All of these velocity circles, for a fixed total energy, can be constructed by stereographically projecting great circles from a higher-dimensional sphere into velocity space. In either case, the plane in which these higher-dimensional great circles lie is precisely that defined by our bivector, . So we get an action of the rotations in the higher-dimensional space on , which conserves the bivector’s overall norm, and hence the sum-of-squares relationship between the associated and vectors for a fixed energy. In other words, rotating the bivector in the higher-dimensional space gives us an action on pairs of vectors that are angular momentum and Laplace–Runge–Lenz vectors for orbits of a particular energy. Thanks for the overview, Greg! One question is whether the two ways of relating elliptical orbits of a certain fixed energy to great circles on the 3-sphere are ‘the same’, at least up to some normalizations. I think you’re answering in the affirmative, since you’re saying in either approach the great circle coming from an orbit lies in the plane defined by the bivector . Another way to get at the answer is to directly relate the circle traced out by the velocity vector of the elliptical orbit to the great circle in Göransson’s approach. Have you tried that? The tricky thing here is that Görannson (and Souriau, and Moser) use a reparametrization of time to convert elliptical orbits into simple harmonic motion, so his velocity is not the true velocity. I’m confident of two things: (1) the semi-minor axis of an ellipse that is the orthogonal projection of a great circle is proportional to the cosine of the angle between the plane of the great circle and the plane it is projected on, and (2) in the usual stereographic projection of the velocity circle from a great circle, there is the same relationship between the angle of the plane of the great circle and the semi-minor axis of the elliptical orbit. As far as I understand Göransson’s approach, both the point and the velocity wrt move in great circles, and unless I’m confused, the two planes will necessarily be parallel. So the great circle traced out by will also be parallel to the great circle in the standard approach, and up to some choice of scaling, both ought to project to the same circles in velocity space. Okay, great! I think you’re right: as a function of the point moves around a great circle on the unit 4-sphere at unit speed. So, its velocity vector does the same, and in the same 2-plane. As a chemist I wonder: Is this a symmetry taking one orbital type into another one? I once saw a picture about it in a book of Peter W. Atkins. Imagine a sphere which surface is marked such that one hemisphere represents the + sign of a wavefunction and the other hemisphere the – sign. Now stereographically project it to the plane. If the sphere is oriented such that its polar axis is perpendicular to the plane you will get only one sign in the plane (similar to a s-orbital), if the axis is parallel to the plane you will get + and – separated by a nodal line (like a p-orbital). Thus, in the plane you create some very distinct “orbitals”, while in space you only have to rotate the sphere. Of course the analogy to the hydrogen atom would set the stage one dimension higher, so it would be a 4D rotation that interchanges orbitals of different types. Unfortunately I never really looked for the mathematical details of the analogy, and I think, it is yet another kind of hidden symmetry of the mathematical treatment of this kind of problem? As a chemist I wonder: Is this a symmetry taking one orbital type into another one? while 3d rotation symmetries only suffice to relate states in a given row. I don’t understand the pictorial approach you’re describing well enough to see if it’s secretly a lower-dimensional analogue of what I’m talking about. I do know that what I’m talking about works in every dimension—if we posit atoms in other dimensions that are still governed by the inverse square force law, which is a bit odd. I looked up the source: It’s “Galileo’s finger – The ten great ideas of science” by Peter Atkins, chapter six “Symmetry” and Fig. 6.7 on page 175. Unfortunately, since it is really a text addressed to laymen, it does neither contain any mathematics nor references where this idea would have been made more precise. I can only guess that Atkins might have written it elsewhere, e.g. in his book on “Molecular Quantum Mechanics”, but I did not checked it so far. 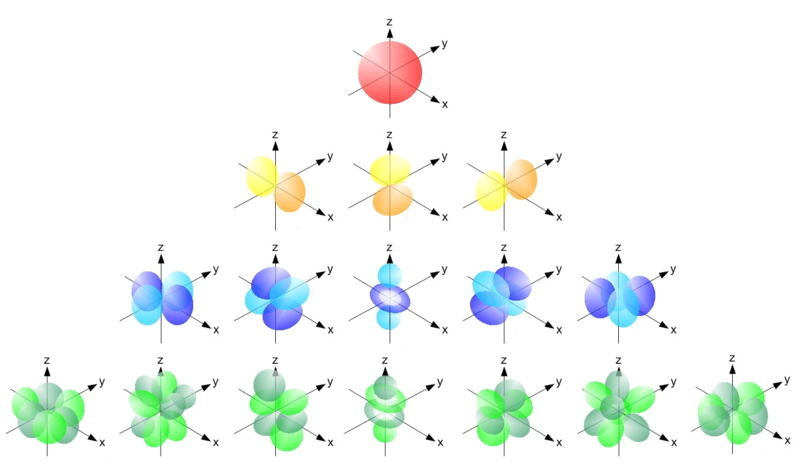 What this means is that the hidden 4-dimensional rotation symmetries of the hydrogen atom can do things like take a 4s state to a 4p state or 4d state or 4f state. I’m not sure if I’m taking you more literally than you intended, or if I’m nitpicking unnecessarily, but although a generic element of SO(4) will certainly take a 4s state to a superposition of states that includes a 4p state (and a 4d state, and a 4f state), I’m not convinced that any element of SO(4) can take a 4s state to a 4p state. That is, given an eigenfunction of the 3D orbital angular momentum operator with , I don’t believe there is an element of SO(4) that takes it to an eigenfunction of with . It’s not inconceivable that there could be such an element, but it seems like it would take something much stronger than having an irreducible representation of SO(4) to make this true. You’re right; I was being pretty sloppy. It would be fun to dig into this issue, and see exactly which vectors you can get by applying an SO(4) element to an ns state, but I have too many other puzzles on my mind to tackle this one! is the group of 4 × 4 complex unitary matrices with determinant 1, and the spinors are these matrices act transitively on the unit sphere in When you get beyond there are pure spinors which are different, and ‘better’, than the rest. • Eyal Subag, Symmetries of the hydrogen atom and algebraic families. Abstract. We show how the Schrödinger equation for the hydrogen atom in two dimensions gives rise to an algebraic family of Harish-Chandra pairs that codifies hidden symmetries. The hidden symmetries vary continuously between SO(3), SO(2,1) and the Euclidean group O(2)⋉R2. We show that solutions of the Schrödinger equation may be organized into an algebraic family of Harish-Chandra modules. Furthermore, we use Jantzen filtration techniques to algebraically recover the spectrum of the Schrödinger operator. This is a first application to physics of the algebraic families of Harish-Chandra pairs and modules developed in the work of Bernstein et al. [Int. Math. Res. Notices, rny147 (2018); rny146 (2018)]. One interesting thing about this paper is that it constructs a ‘space of 2d hydrogen atom state’ for any complex energy. The physical meaning of these seems open for exploration. This is not correct according to the figure drawn. The four points shown are not at the same distance. All you have to do is draw a straight line from the Sun through the points on the ellipse, and you can clearly see that the points on the ellipse are much closer. Don’t worry though, the error is only in the drawing because they didn’t draw the ellipse and the circle with the same exact total area. At that point the dotted arc would overlay the circle and should be eliminated because it would be redundant. Sorry to be picky like that but … you know … it’s mathematics. You’re mistaken about the figure, unless you’re viewing the web page on a device that distorts the aspect ratio; the dashed arc is perfectly circular and it is centred on the sun. I checked the image file itself, and all four points’ centres are 231 pixels from the centre of the sun. I have no idea why you think the two orbits should have the same area (or why you think one of them is circular). The two orbits have the same semi-major axis (as required) and different semi-minor axes, so they do not have the same area. You could choose the new position for the planet so that its orbit was circular, and then the dashed arc would overlay it, but that would make for a far more confusing image because the generality of the construction would not be apparent.